Manufacturer of remote service unit, scrubber etc. Selectable Auto or Manual mode. Programmable Logic Controller with HMI and provision for storing two programs simultaneously. Steam injection, tube drain (please check ordering information). Audible & Display signal to indicate end-of-analysis. 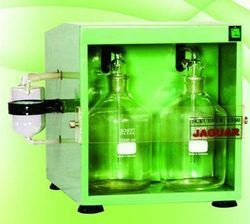 Suitable for 100ml (Micro), 250ml (Macro) and 500ml (Direct Distillation) tubes. Imported geared motor bellows pumps for adding accurate and reproducible volumes of alkali. Imported Oscillating pump for water refilling in steam generator. 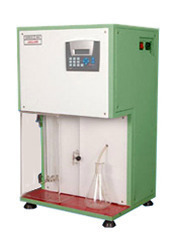 In-built Borosilicate glass steam generator with status indication by means of light bulb. 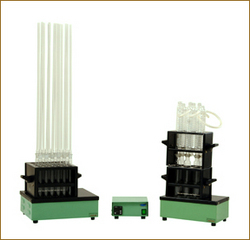 Borosilicate glass splash head and condenser. High sensitive PRV made of Teflon. Coil heater made of incoloy 600 heating element & passivated finish. Cooling water supply controlled by means of electronically operated solenoid valve. Controlled by digital circuit for low water level and excess temperature in the steam generator. Standby mode temperature maintained at 90 C to reduce distillation time and to minimize power consumption. Solenoid valves are made with brass body for corrosion resistance. Transparent window on the body panel to view the status of steam generator. NRV made of Teflon used as vent valve to avoid back suction of distillate at the end of the distillation cycle. Safety features include display indication for Low water level, Tube in place & Safety door (Made of Poly carbonate) interlock. External thumb lever for actuating the tube holder. Front Panel made of Epoxy resin with glass fiber. Resistant to all chemical spills with plastic spill tray. The unit is provided with all necessary silicone and nylon tubing. Uses Official AOAC method for analysis. Homogenous and fast digestion of samples. Custom-built high-density cartridge heater made of stainless steel. Special aluminum alloy block that ensures homogenous heating through out. Optimum clearance between digestion tubes and walls of the wells. Sufficient layers of glass fiber and ceramic fiber bound with asbestos sheet used for insulation of the block. Remote type, precise digital PID temperature controller with auto-tuning and timer facility. Auto-tuner optimizes the value of parameters to maintain temperature accuracy. Timer ensures automatic cutoff of unit after programmed digestion time is complete. Multi cycle programmable ramp type PID temperature controller can be optionally provided based an application. Specially designed leak proof exhaust manifold assembly made of glass with stainless steel tube holder stand. Specially designed stainless steel digestion tube holder. Provided along with chemical & heat resistant Teflon covers for the digestion tubes. provided along with manifold rack. Specially designed vapor aspirator pump made of borosilicate glass with teflon drain value, fixed on a nylon board. Vapor aspirator tubes made of EPDM monomer. Heat deflector plate made of SS316 grade with 1.2 mm thickness. All stainless steel parts are powder-coated. Two stage neutralization with water and alkali. Alkali & Water tank capacity - 2 litres. Diaphragm pump to create vacuum source. Displacement capacity of pump in 25 liters / minute. Hermetically sealed compressor running on Freon12 refrigerant. Compressor starts with a 2- minute delay time, for protection. High efficiency copper condenser designed for maximum heat transfer. Stainless-steel tank housed in aluminum panel for excellent corrosion resistance. Formed copper evaporator in the tank for maximum chilling effect. Heavy-duty motor drives fen to cool the condenser. Submerged vertically mounted pump is an added advantage. Vertically mounted heater ensures leak proof tank. Option of thermostatic or solid state control of temperature. 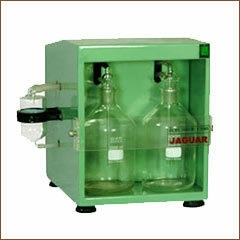 Distillation Unit operable in Auto or Manual mode. Programmable Logic Controller with built - in HMI. Provision for storing two analysis programs simultaneously and can be recalled depends on the analysis routine. 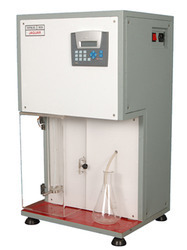 Analysis cycle includes auto addition of receiver solution, water dilution, alkali addition, reaction delay time, steam injection, tube drain (please refer ordering information). Audible & HMI Display to indicate end-of-analysis. Imported geared motor bellows metering pumps for adding accurate and reproducible volumes of alkali and receiver solution. Adjustable Alkali volume per/stroke of bellow pump with programmable number of strokes. 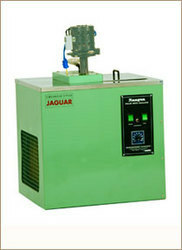 Imported Oscillating pump for reliable water refilling in steam generator. 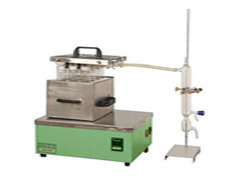 In-built Borosilicate glass steam generator with Teflon cover and illumination by means of light bulb. Special aluminum block that ensures homogenous heating throughout. Sufficient layers of ceramic fiber bound with asbestos sheet used for insulation of the block. We bring to you the stote of the art indigenously developed and manufactured range of analytical equipment opplied in Agricultural, Environmental, Beveroges, Food & Feed and Pharmaceutical Industries. With over a decade of manufact uring experience and more than 100 customer installat ions oil across India in Academics, Research and industry, we are one of few established companies manufacturing this product range. • Built-in cartridge heater mode of stainless steel placed inside the aluminum heating block, to ensure uniform heating throughout block. • Body Panel mode of Mild steel (1.6 thk) with Powder coating. • Up to 85% saving on Time and solvent compared to traditional Soxhiet method. • Energy saving and easy to operate. • Choice of 2, 4 and 6 condenser designs forming the range. • Crude fat in meat and animal fodder, food, pharmaceuticals. • Soluble minerals in textile fibers and paper pulp, petrochemicals. • Animal tissues, soils and sediments, agricultural crops, wastewater etc. Design Specification of the equipment featured in this catalog subject to up-gradation without prior notice due to continuous R&D. ended solvent reagent kits to suit your routine analysis. 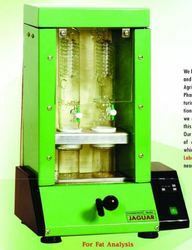 JAGUAR presents state of the art indigenous THERMOKJEL COD digestion unit for analysis of Chemical Oxygen Demand(COD) by Reflux Method in water, wastewater sludge etc. 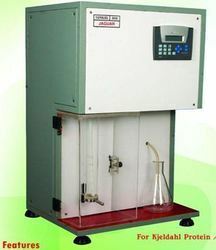 The equipment uses the classical method of oxidation of samples, by refluxing with sulphuric acid and potassium dichromate. The Chemical Oxygen Demand is deduced from the amount of dichromate reduced and is expressed in milligrams of oxygen consumed per litre of sample. Complete with aluminum alloy heater block, one set of digestion tubes, tube holder, heat deflector plates, one set-cooled condensers,tube holder, heat deflector plates, one set of air-cooled condensers or water-cooled condensers, and boiling rods. 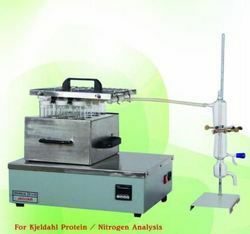 The digestion tubes are provided with ball joint in case of water-cooled condenser and ground joint in case of air-cooled condenser. Highly efficient condensers to facilitate good reflux. 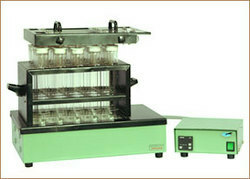 Uniform & Fast digestion of samples with Digestion time around 2 hours typically. Precise temperature control by means of remote PID controller with time setting between 1 – 9999 minutes for the digestion process. Digestion temperature ranges from 40-450 °C. Remote heating ensures high operator safety. Direct heating by means of infra red heater also available. 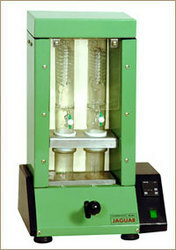 Upto 85% saving on Time and Solvent compared to traditional soxhlet method. Choice of 2,4 and 6 condenser designs forming the range. Crude fat in meat and animal fodder, food, pharmaceuticals. Soluble mineral in textile fibers and paper pulp, petrochemicals. Animal tissues, soils and sediments, agricultural crops, wastewater etc.